This letter from Charles T. Clark of Severance, Kansas, points out the serious criminal offenses attributable to alcohol that have occurred in his city. He indicates that Sol Miller, former editor of the Kansas Chief of Troy, Kansas, is against the prohibition amendment. 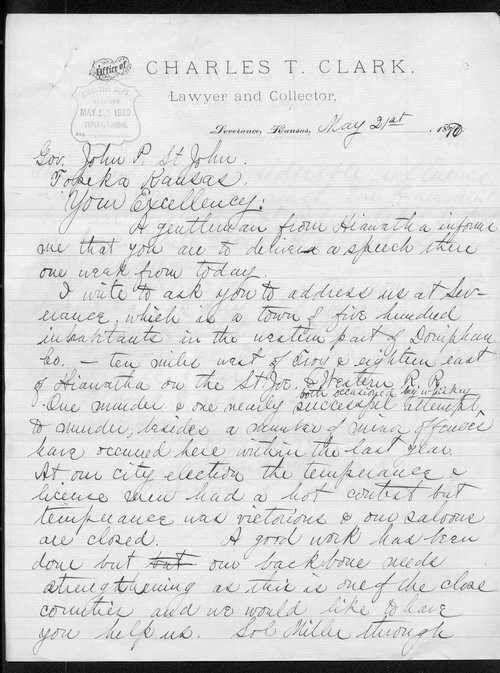 He encourages Kansas Governor St. John to come address the local people and strengthen the cause of temperance. Clark was president of the Prohibition Club. He was also a lawyer and collector.